On 7 March 2016, Young Bangla and its secretariat Centre for Research and Information (CRI) will once again be organizing the “Joy Bangla Concert” at Army Stadium, Dhaka. The concert, which was held for the first time in 2015, will feature music by the top bands and groups such as Warfaze, Shironamhin, Arbovirus, Lalon, Crytic Fate, Nemesis and Shunno. Apart from the music, there will be telecast of the historic speech and the ambience of 7 March, 1971 will be recreated through the performance of a group of artists. The event is free for all and registration for free admission can be done by visiting the following link: http://goo.gl/LRQZ3d. The organizers are also maintaining a ticket hotline @ 01610446632 (from 10:00 AM – 8:00 PM). 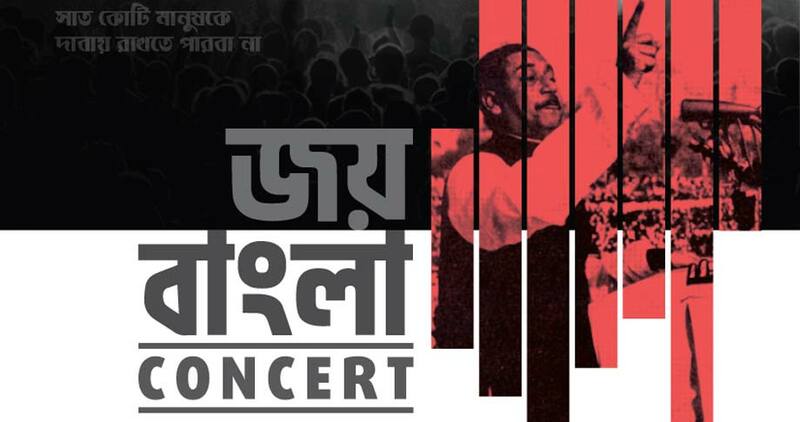 The Joy Bangla Concert seeks to inspire the youth of today through the words of the Father of the Nation, Bangabandhu Sheikh Mujibur Rahman’s historical 7 March, 1971 speech. In his historic speech the great man spoke about equality, justice and standing up for what one believes in notwithstanding the odds against. The concert seeks to imbue the youths of the country with that timeless message using the universal mediums of music, culture and arts. Last year, the concert and its theme turned out to be a very big success and were highly praised by not only those who actually witnessed it on the ground, but also the millions who watched it online or on TV. It was thoroughly enjoyed by 30,000 people at the venue (Army Stadium, Dhaka), while 48,000 or so streamed the event live online. Millions watched it on TV and since the event CRI has distributed more than 1,000 DVD sets of the concert nationwide. The structure and style of the event was also quite unique. The event was opened by the singing of the National Anthem using a musical orchestra coordinated by the celebrated singer Ahmed Imtiaz Bulbul, followed by music from the leading bands and singers of the country who played a fusion of contemporary, metal, rock, classical, and patriotic songs to the delight of all present. The highlight of the concert was the very high quality laser show of the 7 March Speech by Bangabandhu and a rendition of a poem by Nirmalendu Goon recited by the renowned actor and current Minister for Cultural Affairs Mr. Asaduzzaman Noor. If last year was any indication, then this year too, the Joy Bangla Concert is poised to be one of the biggest and most exciting musical events of the year. So, don’t forget to register for your free ticket and share the message with others so that you can all enjoy the event with your friends and loved ones. See you there at Army Stadium, Dhaka on 7 March 2016. Joy Bangla!